Disclaimer: All that is written here are purely my (Ericssan's) personal opinions. Do not send flames. I'm not affiliated to anyone or any organisation or any business. Today I've the privilege to go down to GAb'shop to listen to his TTs (turntables), Zenn stuff and Elgarhorns!!! okie.. I hope u're interested to know wat happened. Well.. I also brought down a digicam and capture some of the actions and tweaks! Horny picked me up near the Tanah Merah MRT and brought me into the Simpang Bedok Neighbourhood. We met up with Nightfly and met a hearty Muslim Chicken Rice. We traded ideas ranging from turntables, tone-arms, stylus, cartridges, resistors, tubes, horns, musicality and second-hand hifi stuff. Well being a vinyl newbie, I asked numerous questions on LP setup. Thanks to Nightfly for the lunch, Horny & I promised to treat him lunch next time round. We adjourned to Gab's shop and I was immediately caught by the size and appearance of Elgarhorns. Well... I have seen a Chinese article on Gab's shop and products... therefore I expect to them there. But I was surprised to find some CD Players there as I heard that there will not be any CDP there! 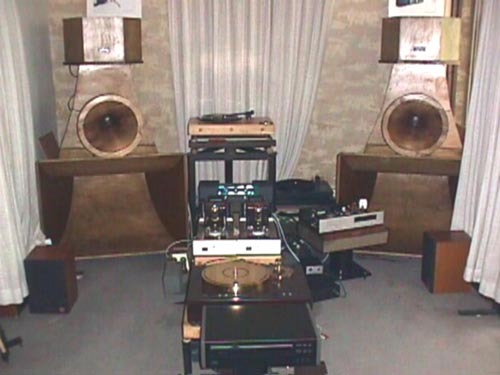 He was pushing his used 211 tube power amp to his Zenn preamp... During our 3.5 hours stay there... we alternate between small box cheapo spkers placed on his specially-designed spkr stands and the Elgarhorns, LP setup and a CDP that is tube-modified. Never in my humble life have I heard so many LPs ... I was spoilt. From jazz, classical, pop to even a rare CHinese 10" LP. I was mesmorised. Horny was particulary drawn to the LP "American Pie by Don McCleen". (sorrie for wrong spelling)... I kissed goodbye to my CaiQing's "Chi Chi De Deng" when I heard Lin Dai sing the same number over LP. I learnt that to get into LP ... I do not need to spend a bomb. 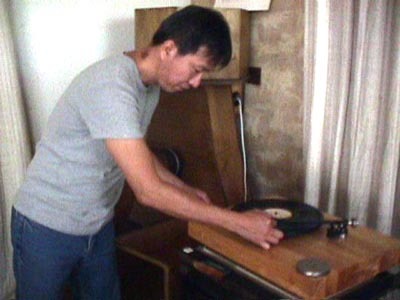 If I dun mind abt getting a old-used tt with tone-arm.. I could still enjoy great musicality. I learnt what is truly 'musical'. When I could ignore the imperfect background of recording and be drawn into the muzik... truly Haaaaaaa. Most prominent of all are the Elgarhorns. driven byhis zenn preamp. He has a modified Regar TT and a modified tube CDP. Most surprised to find a CD player there. The gang that were present @PowWow. is supposed to be at the director's chair. glow of the 211 tubes. Nice pic of Gab putting on yet another LP for us to enjoy. a piece of wood, preferably ebony or better still maple, on top.